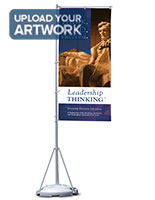 This rectangular advertising pennant stand promotes an organization or company at trade shows, museums, airports, convention centers, retail stores, and more. Attract prospective clients and customers to your business with this easy to use promotional display that measures 13' and can be shortened when needed. 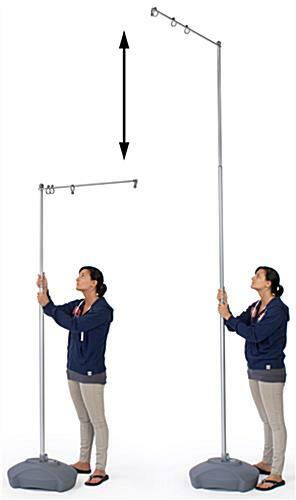 This telescoping flagpole for indoor and outdoor use has a flying design with grommet clasps that captures viewer attention from close and far. Need to advertise at a large-scale event? 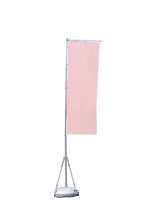 This pennant stand sells without the banner, but it's easy to purchase compatible flags, here (See compatible products on the right side of this page.) 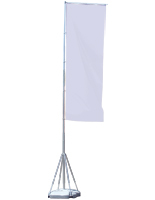 This flagpole has a water base to keep the unit upright in windy weather outside and in busy indoor venues. 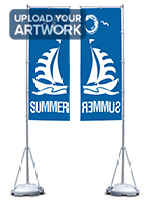 Boost company name recognition and sales with this pennant stand that can be outfitted with a custom logo or taglines that spread the word about your organization. This fixture is constructed of molded plastic and aluminum with hooks that clamp the grommets into place. Busy marketers love this display that sets up and breaks down easily. Fill the base with sand or water to keep the presentation secure in winy weather, or when throngs of customers are expected. Please Note: This product is NOT designed for wind gusts in excess of 20 mph. 16.0" x 7.0" x 21.0"